Two features of this knife caught my attention. It is a trapper pattern knife, but it has a unique handle scale treatment and a Wharncliffe blade has been substituted for the normal spey blade. Case has done some interesting things to the handle scales on the M.T. They dye the scales in a rich amber hue, but instead of conventional jigging they rout the surface of the scales. Then they lightly burn the routed areas. The effect is that the handle scales are reminiscent of stag horn handle material, but they do not look like faux stag horn. I like the look. It is different and it is even nicer in reality than the image above suggests. Case has given this treatment a unique name, 6.5 Burnt BoneStag. The M.T. is one of eight patterns they are using it on in their 2015 spring seasonal run of knives. I would not be shocked to see these knives become standard production items. Beyond the handle treatment, the M.T. 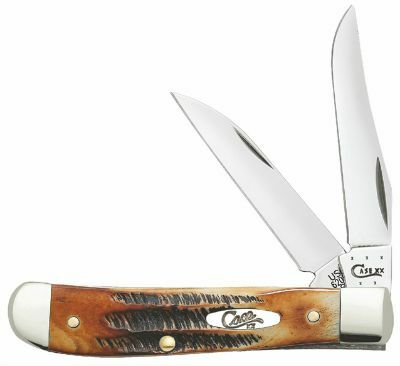 is a typical Case pocket knife with Tru-Sharp stainless steel blades, brass liners and pins, and nickel silver bolsters. Fit between the parts of the knife I received was faultless. Margins joining the scales, liners and bolsters were totally even, as was the matchup of the back springs to the liners and center cut when the blades are closed. The only misalignment I could find was that the working end of the Wharncliffe blade spring was raised ever so slightly when the blade was open. I also could not find anything to criticize about the finish. The blades and bolsters were highly and smoothly polished, barely showing any finishing marks. The factory edges on the flat ground blades were quite good, so that I was able to begin using the knife right out of the box. The handle scale texturing and finish are gorgeous. When the blades of a slip joint folding knife cycle just right, it is said that the knife "walks and talks." I.e., when the blade is opened, the knife clicks (walks) when the end of the back spring and tang come together. When the blade is closed, it snaps (talks) when it seats into the fully closed position. My M.T. walked and talked from the first time I cycled the blades. Sweet! I compared the M.T. with four other pocket knives that I carry and use frequently. It has the best walk and talk of the lot. Two of the comparison knives are from Case, so it is not a brand thing. The M.T. I got may be one of those lucky production knives that came with everything fitting together perfectly. The M.T. is unusual in that the tangs are shaped so that the blades will "half stop" during cycling. (The clip blade is shown in the half stop position in the image above.) This was quite common on slip joint knives a half century or more ago, but is not often seen today. Someone who is not used to this may not like it, but I was pleased to find this blast from the past on a current production knife. I can tell a lot about the quality of a knife from initial inspection, but I learn even more by carrying and using it for a period of time. I was able to give the M.T. a good workout, because shortly after I got it I started a woodworking project. I built a half-dozen wood benches for an outdoor common area at the high school where my daughter is a teacher. (She conned me into doing the job.) I used pressure treated pine lumber, which was still pretty damp when I built the benches. Then, I let them dry enough that they were ready for sanding and staining. Treated wood gets hairy when it dries. There will be instances of raised wood grain on the flat surfaces of the boards and splinters that come up on the edges. The best way to eliminate these problems before sanding the boards is with--wait for it--a Wharncliffe blade. The straight edge and fine point of a Wharncliffe is just the thing for making the precise slicing or digging cuts needed to clean up boards prior to sanding. The Wharncliffe blade on the M.T. is a perfect size for this job. I needed it to be very sharp for making delicate cuts, so I honed the edge on fine grit crock sticks and a butchers steel before I began. The blade performed admirably, plus I ran into some trimming and touchup cuts where the curved part of the clip blade was right for the job. My M.T. will earn its keep if I use it for nothing other than my go-to knife when doing woodworking projects. Work testing the M.T. also revealed that it has very good ergonomics. The trapper handle shape is hand friendly by nature, but after using the M.T. for awhile I realized that it fit my hand unusually well for a knife its size. After closer examination, I concluded that there are two features of the design that account for this. First, the handle scales are thicker than normal in the middle. I believe they were shaped this way to accommodate the unusual routing pattern used to get the stag horn look. The routing is deep, so the center of the scales need to be a bit thicker to accommodate it without making the uncut base of the scales too thin. This gives the center of the handle a bit more girth than normal. To put this in perspective, I compared the M.T. with an almost identical size Case Medium Stockman. The width of the two knives across the liners, springs and center cut is identical; ditto the total width across the bolsters. However, the total maximum width of the stockman handle, including the scales, is 1/2 inch, while the maximum width of the M.T. handle is 9/16 inches. That may not seem like much of a difference, but the M.T. definitely fills my hand better than does the stockman. In addition, when the M.T. blades are closed they have a low profile relative to the handle contour. Accordingly, when either blade is open, the knife can be grasped quite firmly without the spine of the parked blade digging uncomfortably into the fingers. Adding this to the overall shape and center girth of the handle makes for a knife that is quite comfortable and secure in the hand. I knew I liked the M.T., but I did not realize how much until I wrote this review. The knife is made in the U.S.A., using proven components. It sells at a reasonable price (discounted by about one-third of MSRP). It is a welterweight in size and work capacity. It fits my hand very well, so I can use it with confidence and comfort. Finally, it is a really good looking knife. I cannot ask for more.